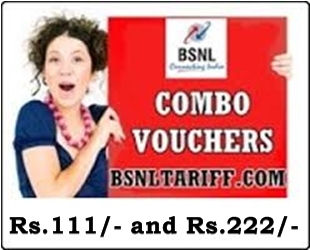 Most Trusted Telecom Brand Bharat Sanchar Nigam Limited (BSNL) has introduced two new Combo Topup Vouchers under GSM Prepaid Mobile Services as promotional basis for limited period across Kerala Telecom Circle. Combo Topup Voucher of Rs.111/- offers, Rs.90/- Free Usage Value and Free 70 Minutes On-net Voice Calls with validity for 20 days. This STV can be activated through Ctopup and sending SMS as STV111 to 53733. Combo Topup Voucher of Rs.222/- offers, Rs.190/- Free Usage Value and Free 110 Minutes On-net Voice Calls with validity for 40 days. This STV can be activated through Ctopup and sending SMS as STV222 to 53733. The above Combo Topup Vouchers will be implemented and with effect from 01-08-2013 to 31-08-2013.